One of the things I love about being a veterinarian is that I can never really know what my day has in store for me each time I walk into Tampa Vet. Of course, I know I’ll be seeing lots of different patients for wellness exams, a variety of maladies, or have surgeries or dental procedures scheduled, but each day is going to be different. Although each day is different for me, there are things that I do every day that are almost exactly the same. Each time I do a physical exam for your pet, I will be doing it the same way and looking for the same things. Although the exam will have different results or recommendations from pet to pet, the exam is the same. The reasons are simple. Your pet ages much more quickly than we humans do. Depending on the breed of your pet, most reach adulthood by their first birthday. That’s equivalent to 18-21 human years. For each year beyond, depending on breed, it’s close to another 6 to 8 years, or more for larger breeds. Let’s say the last time your pet saw a veterinarian was around their first birthday. If they don’t see a veterinarian for two more years, it’s like you or me not going to the doctor for 12 years- or more! We both know that a lot of changes can happen with our bodies in 12 years. Your pet’s weight is one of the most important factors contributing to their current and long-term health. We keep your pet’s weight history and will compare it to their most recent visit. Weight gain or loss could indicate an issue deeper than overfeeding or too many treats. We will discuss your pet’s body score with you and could make diet and or exercise recommendations. If you’re wondering if your pet may be at an ideal body score,check out my blog on that topic here. It may sound unusual, but we will use our nose as well as our eyes to sniff out any trouble with your pet’s ears. 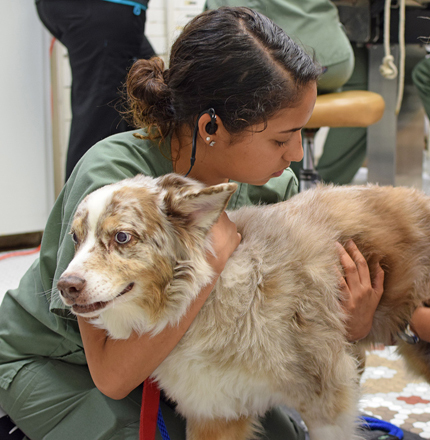 Ear problems, including infections often will smell bad, so don’t be surprised if your veterinarian sticks their nose in your pet’s ears and takes a deep breath. Of course, we’re also going to use an otoscope to look around and make sure everything looks normal. You’ve probably never seen an eye chart on the wall at your vet’s office. That would be silly. The eye exam is one of the shorter portions of the examination, but every bit as important. We want to see how your pet’s eyes respond to light, check overall eye structure and ensure there are no early signs of cataracts. All of our wellness exams cover from the tip of the nose to the tip of the tail. 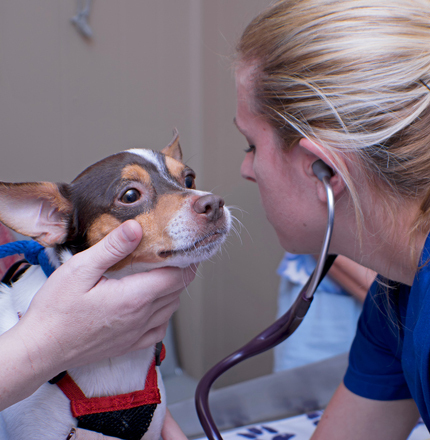 Your pet’s nose is checked for any unusual discharge, which could indicate infection or deeper respiratory issues. Dogs and cats don’t have thumbs, making it hard for them to brush their teeth. Recent studies tell us that fewer than 7% of pet owners routinely brush their pet’s teeth, so we take the time to review your pet’s teeth and gum line for bad breath, inflammation, swelling and tartar. We will give your pet’s dental health a grade of 0 to 4. Here, the lower the score, the better. We may recommend a dental cleaning, or other preventative dental products to help improve or maintain their dental grade. Your pet’s dental health is critical to their overall health, as lingering bacteria can lead to bigger problems over time. These include tooth decay, tooth loss and potential organ disease. Your pet’s skin and coat can tell us a great deal about their overall health. If we notice hair/fur loss, flaky skin or similar conditions, there could be one of a number of underlying conditions. These may be allergies (food, or environmental), parasites such as fleas or lice, or potentially a nutritional deficiency. We may ask more questions about their environment, diet or parasite prevention products you use to help us understand before offering our recommendations to improve your pet’s skin condition. Of course, we’re also feeling all across your pet’s body seeking out lumps or bumps that are abnormal. If we do find something out of the ordinary, we’ll discuss it with you, and may wish to explore it further- or have you monitor the abnormality for changes. We use all of our senses when performing an examination, except for taste. In all of my years as a vet, I’ve fortunately never had to use this sense to diagnose a pet. Of course, we use our sight, smell, touch and when it comes to the heart and lungs, we listen to what’s going on with your pet’s organs. When I put on my stethoscope, I am listening for potential heart murmurs, which is an irregular heartbeat. I’m also trying to detect any abnormalities with your pet’s lungs. When we visit our human doctors, we know to expect the rubber mallet test- where the doctor taps our knee to check our reflexes. Although we don’t use a mallet, we will use our hands to check for responses to touch in certain areas. We’re also checking for abnormal growths, and overall body tone and structure. Tender spots which elicit a reaction may bear further investigation. Remember, these are the components of a routine physical examination. If you have brought your pet in for a specific condition, we will most likely concentrate on that specific condition, unless we see other areas to be addressed. Have you noticed an increase in water intake or food intake? What brand of food do they eat- and how much? If you give your pet treats, what kind and how often? Is your pet being protected against Heartworm disease? When was the last time you gave a Heartworm preventative? What flea/tick prevention are you using? What other supplements or OTC products are you giving your pet? Are there any other pets in your household we have not seen? Is your pet eating/drinking normally? Are they urinating or defecating more or less frequently? Does your pet ever stay in a kennel or boarding facility? Does your pet ever visit a dog park or dog beach? Tell us about your pets physical activities or exercise. If you can’t remember which products you use or give to your pets, use your smartphone and take pictures of them. It’s really important for us to know what is going into your pet, so we can take that in consideration when making any diagnosis of your pet’s conditions. In my next update, we’ll discuss the need to perform bloodwork on an annual basis, and why this is even more important for senior pets.